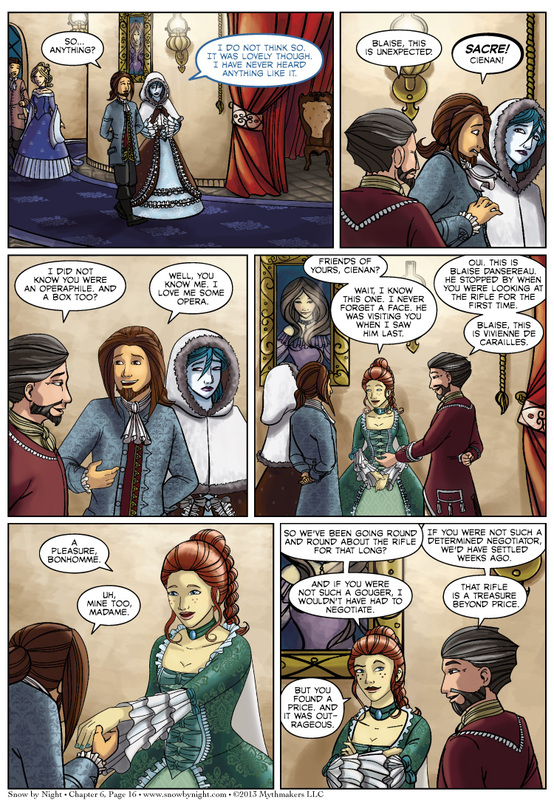 Snow-by-Night and Blaise meet some old friends after the opera on Chapter 6 Page 16. Well, old friends might not be the right word. Terrifying acquaintances? To see a peek at next Monday’s page, please vote for Snow by Night on Top Web Comics. The art contest entries have all moved over to the Extras page where you can peruse them at your leisure. My thanks again to all the talented artists who submitted entries. Just a head’s up. There’s a good chance we’ll be doing this contest again next year. We got another review. Ram Lama reviewed Snow by Night and gave us 3 stars out of 5. Alas, he does not care for my humor, but he likes the vignettes. bet the price was for a date…or marriage! Not unlikely. According to his section on the cast page, he has a lot of affairs (though he said he was asking for a fortune for what he sold her, implying that he was asking for money on the side if nothing else). However, I doubt the marriage idea. Hmm… Snow seems to dislike him. I wonder what that’s about. His cast page says relationships & courtships, not affairs – the distinction being that as he’s a bachelor, he’s not cheating on anyone (which would be an affair). Network Solutions crashing around us last night caused all sorts of issues. This was one of them. It should be fixed now. Quality opera is enjoyable to me; most of the music and singers are good to excellent, the acting is usually good, and as long as it’s in English or Norse I don’t need a score. I still enjoy it with a score when done in Spanish, German, Italian, Russian, Chinese, Hindi, or Japanese. I tend to evaluate it as both a theatrical performance and a musical event. 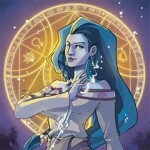 FYI, Creators – on the front cast page (http://snowbynight.com/cast.php), Pénélope has an accurate portrait. But if you click through to the bona fide supporting cast page (http://snowbynight.com/cast_minor.php#Lia), you’ll see that Pénélope is mistakenly using Liaze’s picture. Ty, we’ll get that fixed. That one would be my mistake. :( This is why I shouldn’t be editing at 1 AM, whoops! It’s fixed now, thank you for pointing it out.